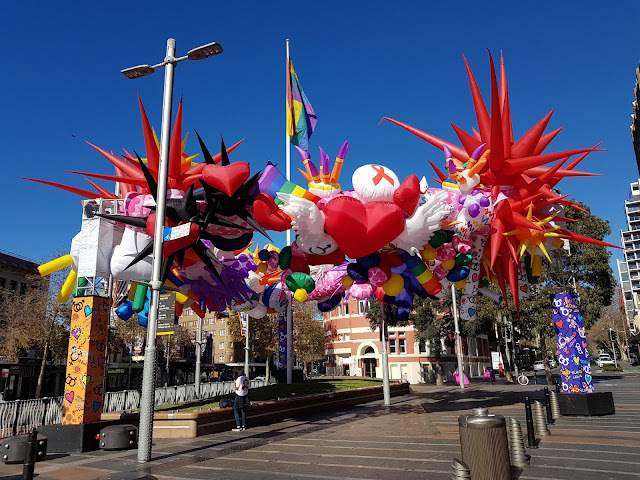 This artwork has been installed in Taylor Square, on the corner of Oxford Street and Flinders Street, in the inner city suburb of Darlinghurst. "40 Years of Love" was created by the Goldberg Aberline Studio (GAS) for the City of Sydney as a celebration of the 40th anniversary of the Sydney Gay and Lesbian Mardi Gras. The symbols featured include those for repression, adversity, freedom, inclusion, diversity and love. Quite an eye catching sculpture! What a fun work of art Jim. Very colourful but it doesn't look very permanent,the fabric will surely fade. Yes, I expect it to be quite temporary. It looks spectacular but indeed a bit puffy. An explosion of colour. I love it. It would be hard to miss all those reds!! I see the blue balloons!